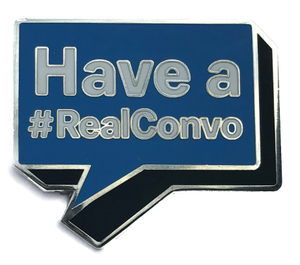 Tell the world you’re ready to have a #RealConvo about mental health with this Blue #RealConvo Pin. Shaped like a speech box, the message “Have a #RealConvo” appears in white against a blue background, with shadowed backing for a 3D appearance. 1.5” x 1.3”. Sold individually.